News about The Roger Thomas Collection’s partnerships and products. Speakman inks exclusive collaboration with Roger Thomas for Wynn Palace Cotai. | News release. 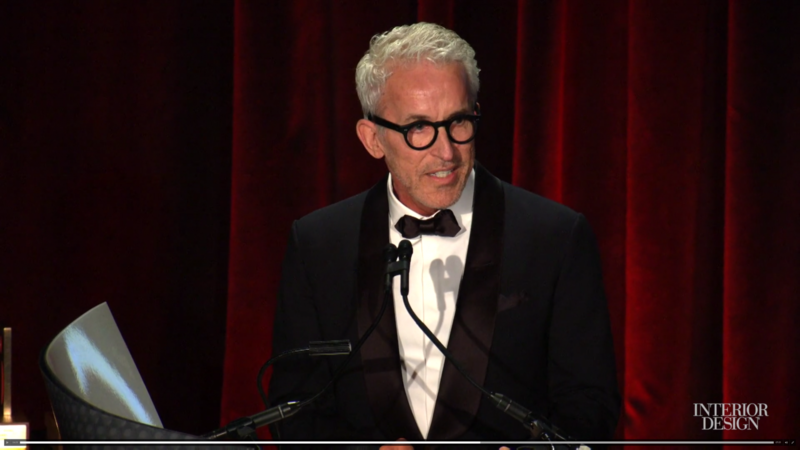 Roger Thomas named to Interior Design magazine’s 2015 Hall of Fame. | Read more. S. Harris previews Roger’s second collection based on the “Grand Tour.” | Read more. Moore and Giles launches The Roger Thomas Collection leathers. | Overview. | Event photos. OW Hospitality launches the “Lost and Found” collection by Roger Thomas. | Press release. Roger Thomas Collection announces new online focus for 2015. | News Release. 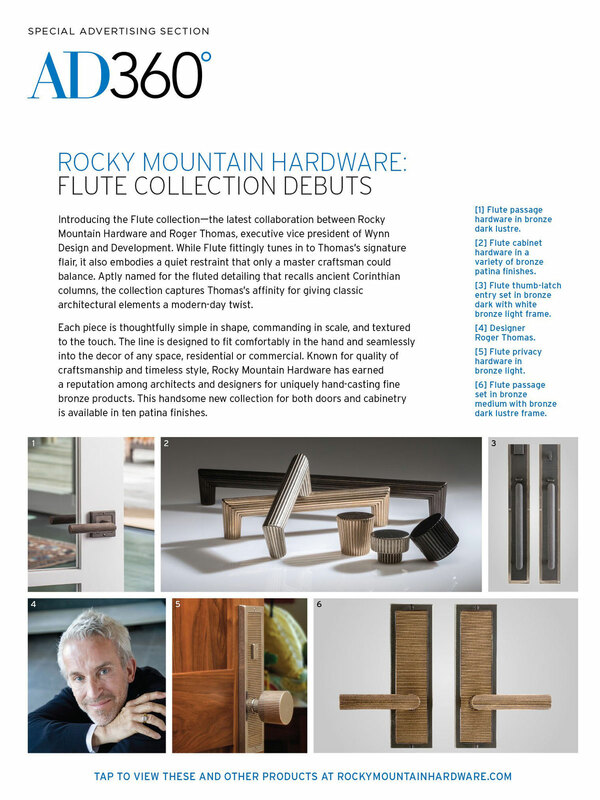 Rocky Mountain Hardware launches the Flute Collection by Roger Thomas. Roger Thomas Collection and OW Hospitality announce partnership for exclusive line of carpets. The Roger Thomas Jewelry collection. Maya Romanoff launches new wallcoverings with The Roger Thomas Collection. | News release. S. Harris announces Roger Thomas fabric collection. | News release. 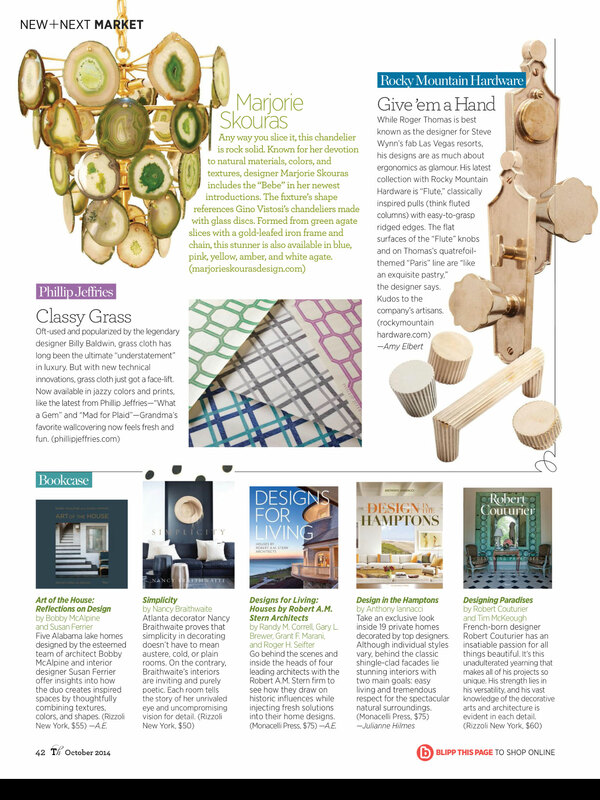 Roger Thomas previews a new collection for Boyd Lighting. Rocky Mountain Hardware introduces RTC’s “Paris” collection. | News release. Fromental and Roger Thomas collaborate on handmade wallpaper. Townsend Leather unveils Roger Thomas-designed faux parchment leathers. | News release.